Immunogen: Synthetic peptide corresponding to the sequence near the C-terminus of rat Grp78 (BiP). The sequence is completely conserved in mouse and hamster. Scientific Background: Grp78 (Glucose Regulated 78kDa Protein), is also known as BiP or Immunoglobulin heavy chain binding protein. It is a stressresponse protein which is induced by agents or conditions that adversely affect endoplasmic reticulum (ER) function. 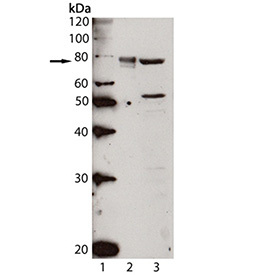 This protein is essential for the proper glycosylation, folding, and assembly of many membrane bound and secreted proteins as well as for maintenance of cell homeostasis and the prevention of apoptosis.